Willowbranch Library patrons miss their familiar ‘haunt’ - The Resident Community News Group, Inc. | The Resident Community News Group, Inc.
Library patrons and members of Friends of the Willowbranch Library (FOWL) came out in force on Oct. 16 to hear what a representative from the City of Jacksonville Public Works Department had to say about the repairs to a water intrusion problem. 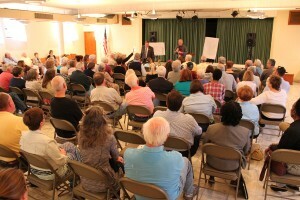 About 100 people listened to a summary of the repair project that began earlier in the spring and was stalled for most of the summer while additional funds were sought to address unforeseen subsurface conditions found during an April walk-around with Stephen Lazar, executive vice president and project architect at VRL Architects. Those funds – approximately $150,000 – were approved by City Council in August and, along with the original project bid, will result in nearly $325,000 spent on this repair. This amount, together with the nearly $2 million that has been spent on the Willowbranch Library over the past 20 years, has some residents wondering when the drain on taxpayers will be plugged. Money, however, was not the overriding concern last month. Most who attended the meeting were more interested about whether the community library at Park and Cherry would be re-opened or if these problems constituted a death blow. Approximately 100 residents attended the community meeting to hear about the problems and the progress with the Willowbranch Library water intrusion project. Barbara Gubbin, director of the Jacksonville Public Library, assured attendees that the library would re-open and the staff was expected to return. The schedule for project completion is tentatively set for mid-January 2015, but it could be earlier if Public Works, the contractor and Riverside Avondale Preservation can come to an agreement about the large Palladian windows. To address the concern about the windows, Angel Corrales, vice president of FOWL, and Carmen Godwin, RAP executive director, took the lead in questioning the decision to have the large steel windows removed, repaired and then replaced. Corrales, owner of American Window Preservation, noted that nine times out of 10, steel windows should not be removed as more damage could occur. It is in the plan, according to Lazar, to remove those windows to install a strengthening rod to protect against high winds, to reglaze the windows and to install new sills. Subsequent to the community meeting, in another meeting with Corrales, Godwin, and Lazar, the Public Works Department agreed to run another water test on the windows to determine if removal for new sills would be necessary. To deal with the water intrusion “once and for all” the problem is being addressed from the roof to the ground, according to Bill Joyce, Chief of Engineering and Construction Management, Public Works Department. Joyce said the “countermeasures” include roof flashing, gutters, downspouts; a drain system to a stormwater pond, which is being updated with French drains at the bottom; a waterproofing membrane below the concrete around the foundation; an underdrain system; reglazing windows and replacing the sills. In the days just prior to the community meeting, a concrete “apron” had been poured around the entire foundation to move water away from the building during heavy rain. Some residents wondered whether the concrete would result in an overflow of water down the sidewalks and paths to Willowbranch Park, but Joyce indicated that a drain overflow system will send excess water by gravity to the nearby creek. Until September the project work had not required closure of the library, but following excessive water intrusion earlier that month, patrons were directed to use the Murray Hill Branch Library for the duration of the closure. Unfortunately, according to Peg Kenyon-Bonhaus – an original founding member of the Willowbranch Library – returning books to the Murray Hill Branch’s drop box is not easy for someone in her 80s.